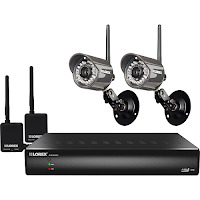 As part of their daily deals Best Buy is offering this Lorex 4-Channel, 2-Camera Indoor/Outdoor Wireless Security System for $300 (reg. $500). That's 40% OFF the regular price and comes with FREE shipping. It's wireless so I'm sure you or your geeky neighbor can figure out how to plop the two cameras somewhere and watch the action from the couch. These come with night vision up to 60 feet, and the 4-channel DVR/500GB hard drive lets you store plenty of recorded video. Watch remotely from your Apple product, BlackBerry, or other devices. Best part? An email will alert you when it thinks something is happening. It's like Skynet for your house.